Macabre meetings, sinister excursions, and deadly relationships; uncanny encounters; a classic ghost story featuring an American god; a historical murderer revived in a frightening new iteration; innovative Lovecraftian turns; shadowy fairy tales and weird myths; strange children, the unexpected, the supernatural, the surreal, and the all-too real . . . tales of the dark. Such stories have always fascinated us, and modern authors carry on the disquieting traditions of the past while inventing imaginative new ways to unsettle us. Chosen from a wide variety of venues, these stories are as eclectic and varied as shadows. 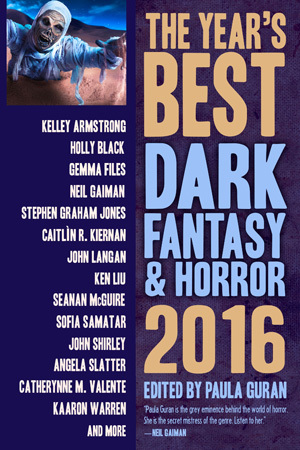 This volume of 2015’s best dark fantasy and horror offers more than 500 pages of tales from some of today’s finest writers of the fantastique—sure to delight as well as disturb. This entry was posted in Uncategorized on January 21, 2016 by admin. Just curious, do you cover Black Static magazine as I noticed nothing from them on the list?